First, a short summary of the events. For some reason Capriles was received by Colombia's president Santos this week. Capriles and the Venezuelan opposition keep their impressive campaign to educate the continent about the electoral fraud that allowed Maduro to retain Venezuela's presidency. A double fraud if you remember that Maduro promised a real electoral audit at UNASUR Lima's meeting to ensure their attending at his swearing in. As soon as he was sworn, the regime simply performed instead an absolutely useless audit and started a ferocious campaign to silence the opposition and place the world in front of the fait accompli of his fraudulent election. At first it seemed that Maduro would succeed when in his own international campaign he was received by Dilma Roussef, president of Brazil and faithful follower of Lula policy to forgive any abuse of chavismo, though if truth be told she is less enthusiastic than Lula on this regard. She offered Maduro help for the food crisis of Venezuela and listened patiently to his explanation of Capriles being a less than nothing, thus implying that Brazil was willing to accept the fraudulent electoral outcome in exchange for the preservation of its 5 billion plus dollar trade surplus. That also means a further dependency of Venezuela from MERCOSUR increasingly lorded over by Brazil as its sphere of interest, or private backyard if you will. The implication of all of this in Brazilian minds is that no matter what UNASUR decides at its meetings, the last word is the Brazil one (in this case forgetting about the promised electoral audit agreed at Lima). UNASUR, allow me to remind the reader, includes strictly South American countries in an association that supposedly ensures the solution of internal conflicts and an alliance of sorts against outside interventions. Chavez always dreaming that he would lead UNASUR when in fact he was the pawn of Lula in that scheme, an extension of Brazilian ancestral imperialist pulsions to control all of South America. When UNASUR was proposed it was at the height of Chavez petrodiplomacy (meaning, using Venezuelan money for his dreams of grandeur). It was also at the height of Lula, when he ruined the proposed free exchange of the Americas proposed by the US, unable to support it as it should as the US was too involved in Iraq and the like. Thus, with Brazil pushing along Venezuela and Mercosur all countries had to join UNASUR, which did not mean for a second that they all liked the idea. Times have changed. Dilma in Brazil has failed to live to her promises of more attention to human rights (except for the distancing with Iran, the least she could do). Instead Brazil seems embarked in some form of protectionist adventure where its economical elite seems more interested in securing a safe zone/perimeter rather than confront globalization. As such the indecent hurry to exclude Paraguay from Mercosur last year on silly pretexts, removing the last block to include Venezuela in Mercosur. Venezuela, by the way, who routinely does more constitutional violations than Paraguay politicians ever did. And there is also Chavez death, just about when the petro check book also died. The Pacific Alliance (Spanish: Alianza del Pacífico) is a Latin American bloc formally launched on 6 June 2012 in Chile's Paranal Observatory at the organization's fourth summit. It groups Chile, Colombia, Mexico and Peru. The four nations of the Pacific Alliance represent about 36% of Latin America GDP, and if counted as a single country they would be the ninth largest economy in the world with a nominal GDP of more than $2 trillion USD, surpassing India. According to information from the World Trade Organization (WTO), the countries of the Pacific Alliance together exported about U.S.$ 445 billion in 2010, almost 60% more than Mercosur (the main economic bloc in Latin America) exported in the same year. In short, the Pacific Alliance is an open trading block, of the maritime kind, the most effective; whereas Mercosur looks everyday more like a protectionist block centered around Brazil. It is in this context that we are more likely to understand why Santos faced a more than likely crisis with Venezuela by receiving Capriles a few days ago. Sure enough, it started with the vile outbreak of Diosdado Cabello declaring BEFORE Maduro or his foreign minster and singlehandedly turning an incident into a crisis. If there was a surprise it was not that the Venezuelan regime would be upset but by the virulence of the crisis at a time when, simply put, Venezuela has no means to put pressure on Colombia. That is, in the middle of a food crisis, where we do not even have toilet paper to wipe ourselves, the regime antagonizes the lone country that could help us the fastest. In fact a Colombian minister was prompt to add that Colombia would only help Venezuela if it offered guarantees as to paying its new bills towards Colombia, driving the point. Needless to say that this week end the regime is backpedaling already, understanding that they are not Chavez to weather such self inflicted storm, and that they were done in by Santos. Brazil is bound to lose a lot if it does not correct quickly its wrong headed all out support for Maduro. If Humala also receives Capriles it would be only a matter of days for the whole Pacific Alliance to side with the Venezuelan opposition in appearance, if not formally. The North South cleavage of the subcontinent would then be growing fast while to Colombia, Chile and Peru would be added soon Costa Rica, Panama and maybe even Canada, amen of Mexico already in and sympathetic to the Venezuelan opposition cause. Uruguay even is interested in that Pacific Alliance which hints at the coming irrelevance of Mercosur if things keep going the way they are. But Brazil can lose even more. Let's remind the reader still reading that Capriles espoused the Brazilian model of Lula for the 2012 election. Little good did it do to him. In addition of the siding of Roussef with Maduro, it did not stop a shameful interference of Brazil in April's election when Lula bluntly endorsed Maduro. As the regime collapses does anyone still think that a Capriles administration will be pro Brazil? And it is not all. Brazil in recent years had a campaign to gain a permanent seat in the security council of the United Nations. All the efforts have been lost, I dare say with the recent fiascoes. How can a country aspire to such a rank when it is unable to protect democracy in its area of influence, and furthermore generates deep divisions as it may happen soon between Mercosur and the Pacific Alliance? Clearly Itamaraty hopes of world leadership are seriously compromised as its actors are revealed to be mere grocery shop managers, more worried about Venezuela paying its bills to them than the long term perspective. Or mere amoral operatives if you prefer. Let's say it: Brazil is not ready for the major leagues, Colombia is. PS: let's also remark that Brazil does not understand that Colombia is not amused by its diffidence on chavismo: when things will get bad, it is Colombia which will suffer the most from a repressive Venezuelan regime. That Itamaraty is not aware of that speaks volumes about the ideological view it has adopted under Lula. You mean they aren't sending tanks to the Colombian border? Re Humala- he didn't turn out to be the Brazilian/Chavista puppet that I and many figured he would be. agree on the Humala surprise. Perhaps the carrot of a Pacific Alliance, far greater than the bloated bumblings from Unasur, Mercosur, et al, straightened him up. Cerebrally satisfying geo-political analysis. Voilà. Thanks, Daniel. Appreciate the deeper view of things, Daniel. Thanks! On the International level Maduro lacks Chavez's ability to score propaganda points, and make grand gestures, while adjusting to the realities behind the scenes. The conference called by Peru's Humala to have Maduro's government and the opposition negotiate an understanding, could have been used to the Maduro's governments advantage by pretending to go along on some points but then eventually reneging on its execution.Instead, by reacting violently and rejecting the proposals off hand, Maduro's government appeared inflexible while alienating a potential Socialist ally. Well, what you describe is the view of the brazilian left, in special that of PT. If you remember, I had warned you against Lula and them way before their true nature was apparent to outsiders. The PT, the same as Chavez & the bolibananas guys, only has a project for retainning power, forever if possible. Because Brazil is institutionally stronger than Venzla we are still able to resist their more anti-democratic urges. Our supreme court (mostly appointed by L&D) still does battle against their most egregious abuses. But Dilma is not much different from Lula, don't be fooled by her more "serious" outlook. I see Pacific Alliance very simpatetically and hope that, one day, a less incomPeTent government might join them. I'm amazed that Venezuelans allow these scum bags to do as they please. The only thing that is going to resolve this is violence. Brazil is not ready for the major leagues, Colombia is. Agreed, Lula did too much damage to the hopes of Brazil of ever becoming a respectable regional power in America. I'd say Mexico, Colombia and Chile are bound to become the most influential countries in Latam. All this episode with the Brazilians, makes me realize that the Brazilians themselves are so self centered, and the Americans are way too distracted with Middle East and Asia, with that distraction causing a significant toll in their economy. That maybe Venezuela, some day, in the future is destined to become the pivot, the fundamental piece of the puzzle, to push for the construction of a single commercial block for the American Continent, far more advanced, far more powerful than the EU and Asia combined, in terms of commercial exchange and GDP, advanced immigration policies and of course responsible fiscal and taxation policies among the states. It will be globalization at its best. 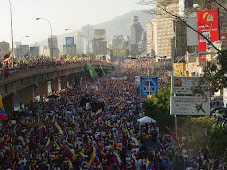 Sad to say but until the people of Venezuela become defiant to the existing government you are a hopeless dreamer. My feelings are that if Capriles were to be in power the US would be more than willing to give their hand in terms of assistance.